Over a thousand military musicians and bands from 11 countries, including the international EU bagpipe orchestra, came to Moscow to participate in the fifth jubilee Military Music Festival ‘Spasskaya Tower’. This year Spasskaya Tower took the 200th anniversary of the 1812 Russian victory in the Napoleonic Wars for its main theme. The festival opened in Red Square with a grand, theatrical show: A stylized, 19th-century ball set the stage with a waltz, only to be interrupted by the intrusion of a sinister Prince of Darkness, Horsemen of Death and the flaming Wheel of War. This was followed by an allegoric battle fought by orchestras with musical instruments, instead of armies with weapons. The two-hour concert featured military marches, a selection of classical pieces, and folk songs performed by bands from Russia, Germany, France, Italy, Austria, Greece, China, Kazakhstan, Poland and Singapore. The EU bagpipe orchestra, dressed in bright, tartan kilts, filled the air with brisk Scottish and Irish tunes. To the crowd’s delight, even the Hellenic Air Force orchestra arrived to perform the familiar theme songs from Indiana Jones, Star Wars and Rocky. Military music performances and festivals in the military ‘tattoo format’ are held all around the globe. One of the first tattoos was the Royal Tournament for military orchestras of the British Empire, which was first held in London in 1880. After WWII the tradition spread to other countries. Today, military musicians from many different countries regularly gather in countries such as the Netherlands, Denmark, Norway, Germany, Sweden, Finland, Belgium, Austria, Italy and Switzerland. Russia held its first military tattoo on September 2, 2006, as part of Moscow Day celebrations. The Central Military Orchestra of the Singapore Armed Forces demonstrated its mastery not only with heavy carbines but also with colorful Chinese fans. The participants from China chose to depart from the theme of the festival and presented a completely civilian performance – a dramatic and unique dance based on the ancient legend of a dragon born by a pond with a lotus. “The dance reflects the rural culture of the Southern China. And since cooperation between villages and the army in China is an integral part of the Chinese state, we believe that this performance fits in perfectly with the concept of the festival,” Chen Yixian, head of the Chinese delegation, told to the press. Yet the performances that resonated most with the audience were those featuring familiar Russian tunes performed by orchestras of foreign militaries. Italian carabineers put on the famous Katyusha, the Singapore Orchestra played the folk song ‘Oy, to ne vecher’, and the Polish Military Orchestra performed the world-renown song Kalinka. The performances moved the Russian audience not only to applause and singing, but sometimes even to rhythmic stomping on the verge of dancing. Given the theme of the festival, one of the most anticipated performers in this year’s Spasskaya Tower was, of course, the French orchestra. In order to convey the spirit of Napoleonic France, the French musicians marched onto Red Square dressed in period, military uniforms. The square in front of the Kremlin was also graced by the famous French singer (and Russian favorite) Mireille Mathieu. The slender singer wore a little black dress in the chilly autumn wind, delivering both the national anthem of the Russian Federation and the national anthem of France, La Marseillaise. Mathieu’s performances in Red Square have become tradition; behind the scenes, the singer is considered a symbol of the Spasskaya Tower festival. The highest point of the show was the performance given by the Russian envoy – the Suvorov Moscow Military Music School orchestra. Vivid, dynamic, and full of dashing spirit, it enchanted the audience. “It was amazing! It was the zest of the whole program,” Elena Kulieva, one of the viewers, told RBTH after the show. The show ended in an unexpected way. The art director of the festival, Mikhail Shemyakin, later admitted that “the most difficult thing was to address the idea of victory with subtlety,” out of respect for the feelings of foreign participants. Thus, idea of victory was interpreted through the notion of peace, friendship and unity between nations, with the final act of the show finding all of the participants gathered around blazing torches. “Here is everyone who used to stand on different sides of the barricade, now gathered around the fire of peace,” said the author of the idea, head of the Military Orchestra Service of the Russian Ministry of Defense Valery Khalilov. All of the participants were happy to support the idea. “What we think is important about this festival is that it serves as some kind of reconnection between Russia and France. 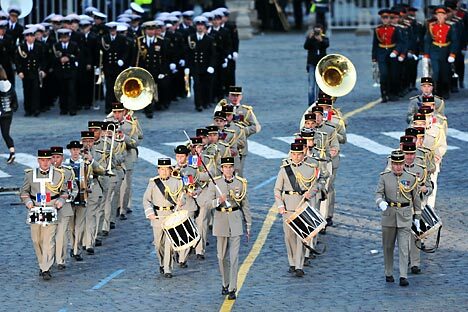 It is the idea of peace and friendship,” said Thierry Moochot, the head of the fanfare band from the city of Haguenau. The head of the Italian carabineer orchestra Massimo Martinelli also believes that the Spasskaya Tower festival brings peoples together. “It gathers participants from different countries and they have an opportunity to show their national spirit, the unique qualities of their national music in their performances. That’s a unique opportunity to develop a closer relationship between our nations,” Martinelli said. “We truly enjoy the genuine spirit of this international military music festival, the sincerity of the event that brings people together,” said Sergei Khlebnikov, the superintendent of the Moscow Kremlin and member of the Public Council of Spasskaya Tower. He noted that the wind and the military music might seem anachronistic beside modern-day synthesizers and innovative equipment. “But this isn’t so. This kind of music resonates with the hearts of the audience. The wind’s music is a brigantine moored in a bay among modern ships. It is the brigantine that draws the most attention. It is beautiful and full of romanticism,” Khelbnikov said. Every single person in Moscow has felt the change in the city’s air brought on by the festival. The top military orchestras have played not only on the Red Square but also in several of Moscow’s parks. And that is just the beginning. The Spasskaya Tower festival will last for over a week, ending on Sept. 8.